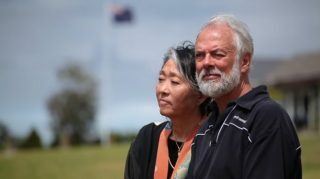 Japanese/American veteran school teacher meets newbie Kiwi teacher turned sailing adventurer – the love story begins. With Maori and Kiwi crew, sails were set for Japan on a 32-foot cement bathtub disguised as a yacht – no fridge, no freezer, no loo. They made it halfway to 7 o north of the equator, then flew the rest of the way to learn and teach in Japan for 2 years. Nurtured by various mentors and cosmic experiences in Oz and Aotearoa, love and respect for each other and the planet grew organically. No talk of vision or values… just living out aligned passions around learning, technology, health and the environment. reduce ‘communication violence’ and strengthen inter-dependence. Combining lessons from ancient Chinese philosophy about Nature’s Elements with Buckminster Fuller’s scientific approach to ‘make the world work’, their TetraMap legacy manifests today in the hearts and minds of TetraMappers around the world. Yoshimi and Jon’s love for each other and the planet sustains. Their work continues to evolve around beliefs in the power of envisioning inter-dependent futures and living values with commitment and courage. These six values underpin everything that we do, say, and offer. Sustainability: We are alert to the impacts of our behaviours, actions, and thoughts, working always toward sustainable solutions. Transparency: We openly and honestly disclose information to keep things clean and clear. Responsibility: We engender trust in self and others and accept accountability for our actions. Inter-dependence: We demonstrate respect for diversity by finding ways to work collaboratively and synergistically with others. Creativity: We proactively seek better solutions and peaceful outcomes. Holism: We work knowing that everything is connected to everything. 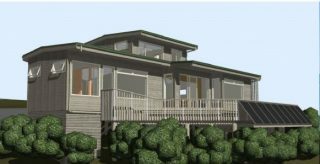 Tanglewood is a new, single-family dwelling designed and built based on the personal and business values of its owners Jon and Yoshimi Brett. Tanglewood’s story is seeded in the wisdom of Buckminster Fuller, Jason McClellan, and the many pioneers who have dedicated themselves to awakening humanity to Mother Nature’s needs over our own. Tanglewood’s focus is on integrative development. The plan of action is based on valuing and leveraging the diversity of all contributors with a thought for how those who come after will benefit and flourish. Integration is about being curious, asking questions, listening and having the courage to care.